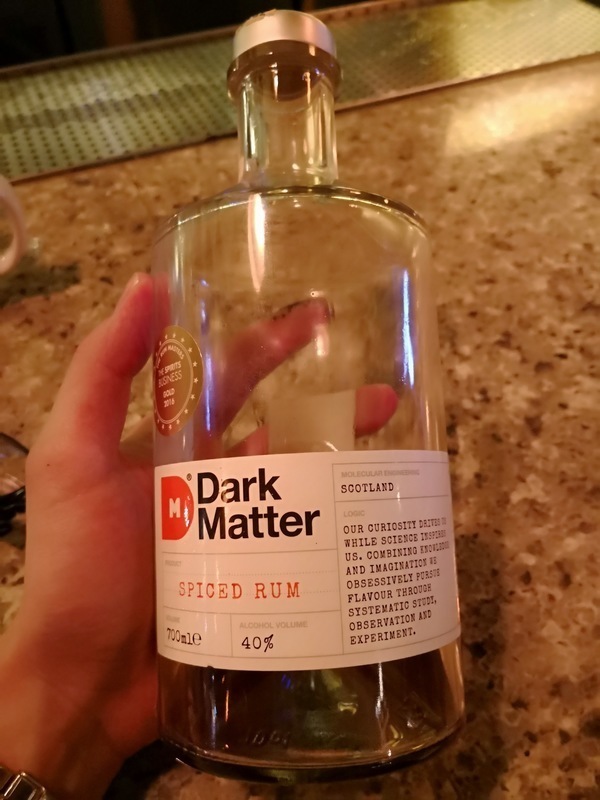 Have you found an online vendor selling Dark Matter Spiced? The marmite of the rum world. Guy who recommended it at our local spirit and wine shop compared it to spicy Hot Cross Bunswhile his brother stated that he hates it. The smell is overwhelming as if the rum is going to be very harsh. Surprisingly, there is no burn at all but leaves a very warm tingly belly. It has a bug taste of cloves and the spicy hot cross buns reference was actually accurate. It's a spiced rum for sure. Peppery, ginger spiced with prominent cloves and cardamom. It like munching marshmallow with a glass of ginger beer with tons of spices. Earthy and herbicious which I enjoy very much (perhaps too much of angustura bitter shots lately, Malaysian Bartender's handshake) follow with gingery spice with touch of caramel. Ginger bread man! Peppery, chili, gingery bite on the finishing. Follow with prominent sweet spices such as clove. Might not suit everyone's palate unless they love gingery spicy food. Definitely not sugary sweet compare to many spiced rum. Laat alsjeblieft schotland hou het alleen bij wiskey maken. Dit is oprecht niet te drinken heb het speciaal mee uit schotland genomen maar helaas. It's a bit different, this one. It has bucketfulls of cloves. One almost expects to see a few loose ones lying in the bottom of the bottle. You may want to drop a cube of ice in there, because it will burn you. The alcohol burn is there, but it is overshadowed by the burn from the cloves. Hence, the way to drink this one is with miniscule sips. I think there's a decent base rum underneath the spices, but you don't really find it straight away. A few glasses in and there is demerara and vanilla, but you have to search for them. I was given a bottle of this as a leaving present from work and whilst I did enjoy it, I might not necessarily buy another. I don't mind the taste of cloves, but this is bordering on too much and I feel it takes this away from what one expects from something labelled as rum. In summary, drinking it on a cold Autumn or Winter evening is ideal, because it will make you feel warm, but as a tasting experience, it is a bit of a one-trick pony. Nice golden color. Strong aroma. Seems like it will be harsh. Smells strongly of cloves, ginger, maybe cardamom. Spicy. At the first sip, surprisingly smooth. Peppery taste lingers. Gingery bite. (Wonder how it would be in a dark and stormy?). Obviously flavored, you almost miss the alcohol in it. I'm sure it's young rums, but it's not harsh at all. Very interesting. This is a very tasty sipper. I didn't try mixing it, especially not with Coke. Not a sweet rum. But very tasty. Would be delicious in sauces. But if you like spicy, and cloves, cardamom, ginger... This is very worth trying. It pours almost brown in colour. Aroma is full of spices, pungent and pleasant. Flavour is a mix of cinder toffee, spices and chilli. Great on its own or mixed with cola and ginger beer, this is one of the best spiced rums out there today. Lovely strong rum, love the spicy rum flavour. Not too sweet but nice with a slice of orange instead of lime. Oh and a bit of coke won’t hurt but can drink without. Unusual. Definitely distinctive. A bit whisky like for me and too harsh to sip. Not bad with coke though. I do like how it makes my lips and tongue tingle mind you. I like what dark matter are trying to do and maybe in a few years we will see better. Dark Matter Spiced Rum is a molasses-based rum that features very strong notes of pepper, fresh ginger, green peppercorns and allspice. If you like your drinks spiced, go ahead and enjoy. I like my rums aged and sweet please. 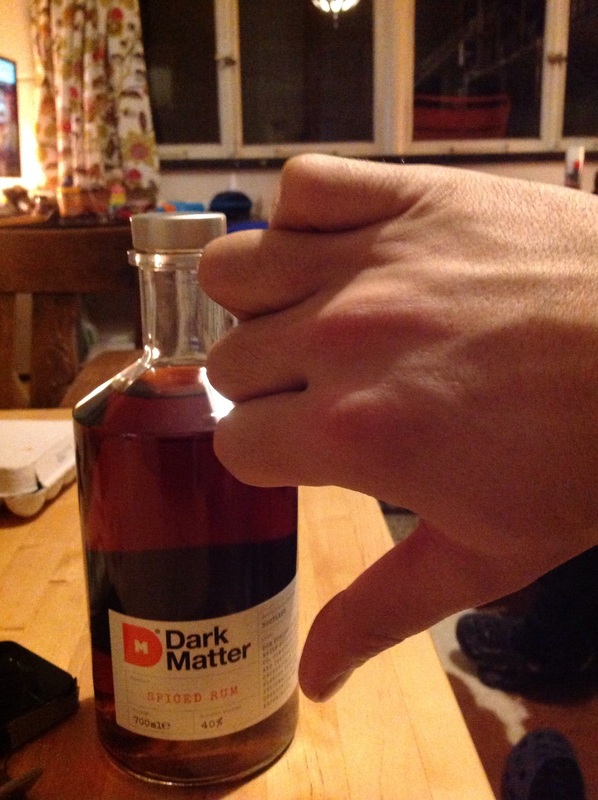 Friend got me Dark Matter. I'm not keen on it but still waiting to see if it grows on me, doubt it will. It's the same mouth feel you get after drinking ginger beer, which I don't like. It's very heavy on the cloves and I don't get much else from it, so I find it quite one dimensional, whereas Rumbullion had a kaleidoscope effect. This is very "peppery" to the nose, almost to the point it forced me to sneeze. Its quit spicy going down pass the throat, and into the chest. I only picked up a taste, from another website. This is not one I would seek out to add to my bar. Having read several of the reviews on here that pan this rum, I was not expecting to like it, imagining it to be a weaker brother to Chairman's Reserve Spiced with all the subtlety of a flying brick. In fact the flavours of the two only have one thing in common - they will both remind you of Christmas. I was therefore pleasantly suprised to find that the overwhelming flavours I got from this were not clove and clove! Yes, there is clove in this as in most spiced rums, but actually what this mainly tastes of is aniseed and cinnamon. After that, I'd say cardamon and a sort of toasted raisin. Next would indeed come clove. I can see why some people say it's a bit like a hot-cross bun - that's the cinnamon, mainly and maybe the fruity-raisin. It's best with a drop of water or an ice cube rather than totally neat. It's subtler than the Chairman's. That one screams Christmas at you, whilst this one sings it. It's also smoother and the rum base is a tad smoother here too. They are both nice rums if you like spiced rums to be strongly spiced rather than weakly (like the new Sailor Jerrys), but this is has a more original taste. It has originality and smoothness and I like those qualities. It would make a good sipper for winter months, but I would drink it occasionally rather than as as a regular. An overpowering aroma of cloves upon opening the bottle , you think this is too much but when sipped seems to redeem itself with a nice mouth feel and no sickly burn. Goes well with both a decent fever tree cola or ginger beer. But for me if this is a Christmas spiced rum then Rumbullion spiced beats this hands down.. I tried this at the recent Manchester rum festival and have since been and bought a bottle. It has some combination of herbs and spices that reminds me of Kinnie, which is a bitter orange Maltese drink - a bit like a soft drink version of Pimms, if you can imagine such a thing. I have made a mental note to try this with some Kinnie when I can get my hands on some. So far I have tried it with cola, and neat. The effect it has is like no other drink I have ever had, I'm sure it has some sort of magic 'relaxing' herb in there! Anyway, it's our new favourite bedtime tipple. I think it's amazing. Not for me. Enjoy the story. Not the spiced. Woof. What did i just taste.. Tastes like a blend of fireball and swedish punch.. I would like to say that i hate it.. But this socker grows on me.. Awesomeness in a bottle. Crazy spicy! Nice, but maybe too spicy for its own good. Like when you get those ginger beers which have too much real ginger, and it blows your socks off. Like that, but with spicy rum. I do like my spiced rum, but this was a bit much for me. Had to pile in a few ice cubes to take the edge off, and eventually found a good drinking balance.